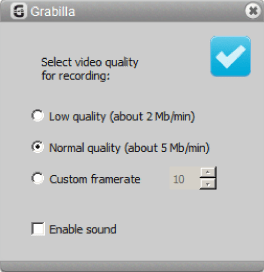 Grabilla can record video of your desktop with voice recording. To enable voice recording you need to tick checkbox Enable sound after selecting an area to capture. Now you can use your microphone to record voice with video. If you do not want to make voice comments while capturing video, and want to put some music in background, just launch your favourite media player and put your microphone next to speakers.